The Republic of Azerbaijan has a very rich flora. There are more than 4,500 species of higher plants here. The flora of Azerbaijan is much richer in the number of species than the flora of the other republics of the South Caucasus. Sixty-six per cent of the species growing in the whole Caucasus can be found in Azerbaijan. The richness of Azerbaijan's flora and the variety of its vegetation results from the variety and richness of its physical-geographic and natural-historic conditions and from its compound history influenced by the remote floristic regions. Relict genera of the tertiary period can be frequently found in all the zones of Azerbaijan, especially in Talysh. They are the iron tree (Parrotia persica), the Lenkoran acacia (Albizzia julibrissin), the basket oak (Quercus castaneifolia), the Caucasian persimmon (Diospyrus lotus), the evergreen shrub of Ruscus hyrcana, the box tree (Buxus hyrcana), etc. There are 240 endemic species of plants in Azerbaijan. 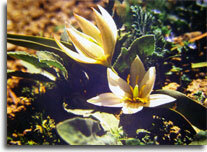 In the flora of Azerbaijan there are representatives of all the types of floristic areas, e.g. ancient wood, boreal, plain, xerophytic, desert, Caucasian and accidental. The representatives of the ancient wood type are most widely spread in the region of Talysh, and the boreal type is spread in the high mountains of the Minor and Great Caucasus and a little in the lower areas. Meanwhile, the xerophytic, Caucasian, plain and desert types are spread on the lowlands, foothills, the Steppe Plateau and, most of all, on the Kura-Araz lowland. The accidental type of floristic areas is represented inconsiderably. In the Kura-Araz, Near Caspian and other lowlands there are many lakes, pools and bogs rich in vegetation. Cosmopolite-like thickets of reed (Phragmites communis) are widely spread along rivers and irrigation canals, in boggy places and, locally, in the lowland districts. In them one can find Alopecurus myosuroides, Cynanchum acutum, Cressa cretica, Typha sp., Echinochloa, Calamagrostis, etc. Here Erianthus purpurascens of obviously savanna type has been preserved. In the ditches of the Kura-Araz plain Cynodonetum (Cynodon dactylon), Glycyrrhizetum (Glycyrrhiza glabra) and Bolboschoenus maritimus is spread more or less widely. In the Karabakh plain more often occur Limonium scoparium, Polygonum patulum, Stachys palustris, Lythrum salicaria, Iris, etc. They form thickets and also occur in those produced by other species. In the dead water and estuaries (especially the Agzibirchala estuary) an abundance of Typha species occurs. Rather typical are Nelumbium caspicum, Nymphaea alba, Nymphoides peltatum, Utricularia vulgaris occurring here and there. Widely spread is Salvinia natans and other aquatic plants. They also often occur in the Kura-Araz lowland. The thickets of Arundo donax are also typical of the lowlands. Marshy territories are widely spread in the territory of the Talysh plain. There are marshes with predominant Potamogeton pectinatus, Myriophyllum spicatum, Trapa hyrcana, Ceratophyllum demersum, Iris pseudocorus, Sparganium erectum, Heleocharis eupalustris, and others. In drying marshes scattered all over the plain typical are short plants. Among them the most widely spread are Ranunculus ophioglossifolius, Buschia lateriflora, Lippa nodiflora, Mentha aquatica, Polygonum minus, Alisma plantago, etc. Water-boggy plants occur also in foothills and in mountainous zones of different heights. They are especially numerous in sub-alpine zones, where more than 100 marshes and marshy habitats are represented. Vast areas of the Kura-Araz, Near Caspian and other plains are covered with desert and semi-desert vegetation. Halocnemetum is most developed in the saline deserts. Short bushes of Halocnemum strobilaceum contribute to formation of hummocks. Especially large hummocks are observed in the saline places of Lokbatan, Mugan and East Shirvan. Kalidietum is developed mainly on the Near Caspian plain and in the Kura-Araz lowland. The Halostachydetum desert is also spread in these zones. As compared with the above-mentioned desert formations, up to 5 or 6 ephemeral and sub-ephemeral species are observed among the Halostachydetum. The Suaedetum desert occurs in East Shirvan and partly in foothills. Three kinds of Salsoletum create vast and fruitful semi-deserts in the Kura-Araz lowland. Especially Salsola nodulosa creates deserts, or semi-deserts on developed soils, independently or with the Artemisia fragrans wormwood. The Salsoletum dendroides desert formation coincides with slightly saline soils and contains dozens of ephemeral and sub-ephemeral species. These communities produce semi-desert thickets with wormwood, Alhagi and Glycyrrhiza. There are 22 species of Salsola in Azerbaijan, most of them creating formations. In the Sheki plateau region thickets of these species are observed in slightly saline habitats, being very bright and colorful while bearing fruit. Wormwood formations (Artemisietum) are the most widely spread type of desert vegetation. It is mainly developed on fine-earth alkaline gray soils of low salinity. They often form semi-desert formations with Salsola species or perennial cereals. All the kinds of Artemisietum include 30-35 or even 50-55 species of ephemeral and sub-ephemeral plants. E.g., Poa bulbosa, Bromus japonicus, Lolium rigidum, Eremopyrum orientale, Erodium cicutarium, Medicago minima, Medicago coerulea, etc. are believed to be constant members of wormwood formations. Low shrubs also occur in those communities. The littoral and sandy coastal soils are habitats for Artemisia arenaria, Artemisia scoparia, Convolvulus persicus, Melilotus caspius, Astragalus hyrcanus and dozens of ephemeral plants. The rare species richly represented in the coastal vegetation of Apsheron are mainly observed in spring, when they are biologically active. Then they fade soon. As for the semi-steppe and steppe vegetation, it mainly includes copiously spread cereals, such as Festuca, Stipa, Agropyrum cristatum, and also Medicago transcaucasica, Centaurea reflexa, Gypsophyla steveni, Teucrium polium and other perennial and annual species. Mountainous xerophytic vegetation often mixes with steppe formations, producing particular communities. In the torrid regions of the republic (the Nakhchivan Autonomous Republic, Jabrayil, Zanghelan, Steppe Plateau, Zuvand) a specific mountainous xerophytic vegetation is developed, forming communities known under the names of Phrygana, Shiblyak, Tragakanth, Acantholimon, juniper, pistachio and other formations, etc. The Phrygana of Nakhchivan is very diverse at 1,000 to 1,500 meters above the sea level, with more than 300 species represented. The species of thyme (Thymus) are very typical of those arid habitats. The following species are often observed there: Lactuca, Berberis, Zygophyllum atriplicoides, Astragalus szovitsii, Salvia dracocephaloides, Pyrethrum, Marrubium, Achillea, Phlomis, etc. In the republic the Shiblyak vegetation occupies small areas, as compared to Phrygana. Well-preserved are in some places of the Nakhchivan Autonomy such representatives of the Shiblyak as communities formed by Paliurus spina-christi, Rhamnus pallasii, Cotoneaster racemiflora, Amygdalus fenzliana, Caragana grandiflora, Spiraea crenata, etc. Those formations are represented well in mountainous xerophytic vegetation. The formations of Pistacia mutica, Juniperus, Cotinus, Celtis, etc. are also typical of the republic and create particular communities. In the arid Eldar Oyugu range located in the northwest of Azerbaijan there is an isolated spot of typical thin forest formed by Pinus eldarica, which is an endemic relict of the tertiary period. The natural thin forest includes such higher plant species as juniper, pistachio, Paliurus spina-christi and 30-35 others. These communities obviously belong to the mountainous xerophytic type. Along the major rivers (Kura, Araz, Ganikh, Gabirri) as narrow interrupted lines stretched are Tugai forests with southern willows, mulberry trees, elms, pomegranates, hybrid-type poplars, Elaeagnus, Tamarix, etc. A considerable number of shrubs sometimes form a mixed forest along the banks of mountainous rivers or in river valleys, e. g. Hippophae rhamnoides, Elaeagnus, willows (Salix), Rhus coriaria, Tamarix, mulberries, pomegranates, wild roses, blackberries, etc. Hippophae rhamnoides is most widely spread in the valleys of the Shin, Kish, Damiraparan, Turyan, Geychay, Agsu, Velvele and Terter rivers. Along the rivers of Talysh grow Pterocarya pterocarpa and Alnus subcordata, sometimes forming considerable plantations. Another species of alder, Alnus barbata, is typical of boggy woods in Talysh. In the coastal forests of Talysh typical are local endemic species of fig (Ficus hyrcanica), Humulus lupulus, Smilax excelsa, Sambucus ebulus, Carex of many species, Cardamine, Poa, etc. In the marshes the species of Juncus form the marshy communities of Juncetum. Local-type lowland forests can be found in Guba-Khachmas and Karabakh and also in the Alazan-Ayrichay valley. They mainly include such trees and shrubs as Quercus longipes, Ulmus, Crataegus sp. div., Mespillus germanica, etc. The Alazan-Ayrichay valley forest also includes Acer velutinum, Tilia caucasica, Fraxinus excelsior, Pyrus caucasica and several other trees and shrubs. Here occur such creeping plants as Smilax excelsa, Hedera helix, Clematis vitalba, Vitis silvestris. There are various forms of the long-stalk oak (Quercus longipes) in the lowland forests. As for the lowland forests of Talysh, Parrotia persica and Quercus castaneifolia are the most typical species of trees there. Besides those relict species, the Talysh lowland forests are rich in Carpinus caucasica, Zelkova carpinifolia, Zelkova hyrcana, Ulmus elliptica, Prunus caspica, Populus hyrcana. At the lower layer of the wood occur the evergreen shrubs of Ruscus hyrcana and Danae racemosa. The Caucasian persimmon (Diospyrus lotus) forms groves usually on more shadowy and humid hillsides. Gleditschia caspica is the major species of tree in Talysh. It forms autonomous forests in the Talysh foothills, with Albizzia julibrissin, Tilia and others admixed to them on the hillsides facing the sea. At somewhat higher level above the sea Acer velutinum occurs, and Fagus orientalis occurs on the northern hillsides, forming high forests. Taxus baccata, box trees (Buxus) and Danae form the lower layer of the wood. In the Great and Minor Caucasus Mountains broad-leaved forests occur at 600-1,800 meters above sea level. Quercus iberica, Fagus orientalis and, in the higher zones, Quercus macranthera are the main species there. Fagetum is a very productive forest rich in species. Besides beeches (Fagus) and oaks (Quercus), there are lime trees (Tilia), hornbeams (Carpinus), 5-6 species of maples (Acer), and especially Acer trautvetteri growing together with the Eastern oak (Quercus macranthera). No grass cover can normally develop in thick beech forests, but if they are lighter to a certain extent, then shrubs and grasses grow. E. g., holly, ferns, blackberries, Rhododendron, Sambucus, Fragaria vesca and numerous cereals are spread in the lower layer of the wood. Quercus iberica and Carpinus caucasicus form a wide strip in the medium mountain belt, with rowan trees (Sorbus) widely spread. In the alpine belt (1,800-2,000 meters) Quercus iberica is replaced by Quercus macranthera, which forms forests of park type. In this belt there are also sub-alpine meadows and high grasses located close to park-type forests. Quercus macranthera, Betula litwinowii, Betula pendula, Acer trautvetteri are spread on the sides of high mountains, forming woods there. Birch (Betula) trees are often stooped on the northern slopes because of snowy avalanches. The Caucasian rowan tree (Sorbus caucasigena) is typical in thin forests. Among the conifers two species of pine trees (Pinus eldarica and Pinus kochiana) are spread in Azerbaijan. Pinus eldarica occurs on the Steppe Plateau at 600 m above sea level, while Pinus kochiana occurs at 1,600 m above sea level in the region of Gyok-Gyol (the Minor Caucasus) and in the medium mountain belt in the Bulanig river valley of the Belokan region in the Great Caucasus. Pinus kochiana and birch trees form mixed groves on the large rocks near Gyok-Gyol. Besides, such representatives of conifers as Taxus baccata occur in forests, and juniper species occur everywhere. Among the evergreen shrubs Rhododendron caucasicum forms small thickets in the sub-alpine belt of the northwest of the Great Caucasus, particularly in the Zakatala and Belokan districts. At 1,800-3,200 m above sea level sub-alpine and alpine meadows and meadow-steppes are spread. True sub-alpine meadows include dozens of formations depending on the relief of the high mountains and the macroclimatic peculiarities. High grasses also create a peculiar formation in the sub-alpine zone, with the structure and composition being very various. High grasses and most of the sub-alpine plants are post-wood species. The high grasses mainly include Heracleum, Achillea, Cephalaria gigantea, Filipendula ulmaria, Calamagrostis arundinacea, Brachypodium silvaticum, Agrostis capillaris, Poa nemoralis, Koeleria gracilis, Vicia, Melilotus, clover (Trifolium), Verbascum, Aconitum, Delphinium, Dactylis glomerata, various species of the Rose family, etc. The sub-alpine belt includes more or less mesophytic meadows and drier meadow-steppes up to xerophytic formations. Those meadows include various species of cereals and clover, Geranium, Inula, Cephalaria, Scabiosa, Galium, Tragopogon, Betonica, Primula, Plantago, Rumex, Urtica, Cirsium, etc. Some 1,000 species are spread in sub-alpine meadows. The alpine belt vegetation is widely spread at 2,400 to 3,200 m above sea level and is represented by the elements of meadows and carpet grass. Vegetation is formed at these altitudes mainly on sloping hillsides, cupola-like peaks, mountain passes, saddles, etc. The alpine vegetation is not so rich in species as the sub-alpine vegetation, but it forms very bright and colorful meadows and carpets, which are of certain economic importance. The alpine vegetation of Azerbaijan is represented by two versions - alpine meadows and carpet grasses. Short-grass alpine meadows are represented by sedges, cereals, such as Carex, Festuca ovina, Zerna, Elyna, Kobresia, etc. Myosotis alpestris, Veronica gentianoides, Taraxacum stevenii, Trifolium ambiguum, Alchimilla caucasica, Potentilla, etc. are very frequent here. Meanwhile, carpet grasses also include two types of formations: 1) typical alpine carpet grasses on the fine earth substrate (caraway, Alchimilla, Plantago, etc. ); and 2) stony carpet grasses on the stony substrate (Sibbaldiae, Campanulae, Macrotomiae). Copyright © 2010-2015 Azərbaycan Respublikası Mədəniyyət və Turizm Nazirliyi.